Earlier posts on this blog have outlined the stories of the first-generation 'Lithuanian Anzacs', men of various ethnicities who had been born in czarist Russia within the borders of present-day Lithuania in the late 19th century and who served with the First AIF (Australian Imperial Force) during World War I. As we approach the centenary of the end of that war, I thought it would be interesting to look back at where some of them were on Armistice Day 1918. By the end of the European summer in 1918 it was becoming clear that the Great War was coming to an end and that the Central Powers were near defeat. An armistice with Bulgaria came into effect on 30 September 1918, followed by Turkey a month later, then Austria-Hungary on 3 November and finally Germany on 11 November. Nevertheless, the fighting continued on the Western Front right up until the 11th of November. Reports from the field record an abrupt end to the bombardment at 11am and an eerie sense of numbness, exhaustion and quiet on the front lines. In contrast, celebrations had started earlier in the day in many towns and cities across the world, later followed by bonfires and fireworks near some of the front lines that evening. At least 40 'Lithuanian Anzacs' served overseas during World War I and nearly half this number were still in Europe at the end of the war. Many of their stories have been outlined previously (click on their names below). A summary was also posted earlier [click here]. The longest-serving were Stanislaw Urniarz (Stasys Urniežius) and Militan Schatkowski (also known as Militan Oldham) who had both enlisted four years earlier, in November 1914. On Armistice Day 1918 Private Urniarz was still in the field in northern France, working at the 2nd Australian General Hospital; soon after he was permitted to proceed on furlough to the UK. Private Schatkowski/Oldham had already been in the UK since early 1917 and was working for the Australian Red Cross in London on Armistice Day. Several of the Lithuanian Anzacs had been wounded on the Western Front and transferred to England by November 1918. Private William Frank Jaks was severely wounded in September and invalided to England; he met Armistice Day at the Reading War Hospital. Private Gerard Skugar, wounded in August, was at the Devonport Military Hospital (Plymouth). Private Leo Gordon was wounded in action for the second time in October and was at the 1st Auxillary Hospital at Harefield on Armistice Day. Private Paul Finn, wounded in action for the third time in August, was in medical repatriation in England. Others in England for medical reasons included privates Harry Cooper, Joe Caplan, Anthony Januski and sapper Ishai Belkind. Some had suffered wounds but were still active combatants in the field as Armistice Day dawned, including Private Heyman Wolfson (enlisted in 1915, wounded in 1916). A few were fortunate to meet Armistice Day in the field and to have survived the war without apparent major injury, including: Corporal Emerick Schimkovitch (enlisted in January 1916, in the field in France from October 1916); Private William Kalinowsky/Kalin/Kalinauskas (enlisted September 1916, in the field from December 1917); Driver Joe Ipp (enlisted February 1917, in the field from November 1917); Private Stanley Zygas/Stasys Žygas (enlisted September 1917, in the field from April 1918). Still others had enlisted late in the war and had been sent overseas but not yet entered the field of battle. David Wishman enlisted in May 1918, disembarked at London at the end of September as a private with the 34th Bn and and was still in the UK on Armistice Day. David Minor (died 11 May 1918 in northern France, buried at Meteren Military Cemetery). 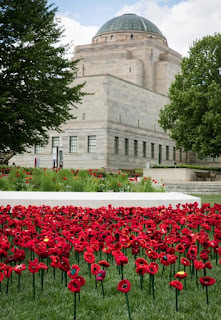 Handcrafted red poppy flowers on the Australian War Memorial's grounds representing the almost 62,000 Australians who lost their lives during the First World War. The article below appeared in a Melbourne newspaper in May 1941. It raised a number of questions when I read it recently, in particular how could a Lithuanian woman and her son make their way from Vilna (today known as Vilnius, the capital of Lithuania, but from 1922 to 1939 it was known as Vilna having been temporarily annexed by Poland) to Australia during World War Two? The only organised evacuation from Lithuania and the other Baltic States to Australia that I knew of was that of the 173 British nationals who arrived on the SS Haitan in December 1940, and the Wajslic family were not part of that group. A little while later a search of the web revealed some further details. The National Archives of Australia site showed that Yochweta (also referred to as Yochevet or Jochweta) Wajslic and her son David had arrived on the Suwa Maru in May 1941. Yochweta was born in 1887 in Blonie, Poland (not far from Warsaw) and her nationality was given variously as Lithuanian, Polish, or stateless. David was born in 1922 in Warsaw and his nationality was noted as either Polish or stateless. These archival documents suggested that the family were Polish Jews. Monash University's accumulated history of 'Yiddish Melbourne' yielded an interesting biography of the Wajslic's husband and father, Jacob Waislitz - also listed elsewhere as Vaislitz or Vayslitz - http://future.arts.monash.edu/yiddish-melbourne/biographies-jacob-yankev-waislitz/. Born in Poland, he was a 'world renowned Yiddish actor and director' who had arrived in Melbourne in January 1938 as part of a world tour of plays and solo performances. He was in Australia when war broke out in 1939, but his wife and son were stranded in Vilnius. Fortunately they were able to escape in 1941 via the Trans Siberian Railway and Japan; Jacob had secured Australian entry visas for them and 'they were able to board the last boat bound for Australia'. From the information available it appears that this family originated in Poland, as opposed to the disputed Lithuanian-Polish territory of Vilnius. However, both Jacob Waislitz and his wife Yochweta had been members of the Yiddish Vilner Trupe (Vilna Troupe), a theatrical group established in 1916 in Vilnius which later relocated to Warsaw. The Vilner Trupe was highly regarded at the time and had toured Europe and the USA in the 1920s - hence the newspaper's reference to Yochweta as an actress. Further information on the Vilner Trupe is accessible through the web, for example: http://www.yivoencyclopedia.org/article.aspx/Vilner_Trupe. It still isn't clear why Yochveta was described as a 'Lithuanian' actress in the Australian press. Perhaps there was some misunderstanding and someone having come from Vilnius was assumed to be Lithuanian? Perhaps membership of the Vilner Trupe suggested Lithuanian nationality? Another speculative answer may be that Yochweta and David were part of the estimated 15,000 Jewish refugees who made their way from Poland to independent Lithuania in the months after the 1939 German invasion of Poland. 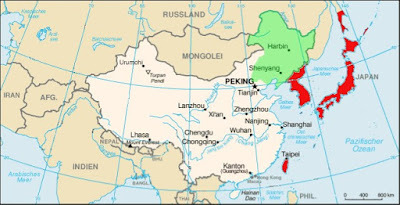 They may then have been amongst the six thousand Jews who succeeded in obtaining transit visas from the Japanese consul Chiune Sugihara in Kaunas to enable them to travel by the Trans Siberian Railway to Japan. Sugihara, however, had to leave Kaunas in September 1940, so the timing for the Wajslic family's departure - several months later - doesn't neatly align with this hypothesis. Perhaps someone knows the answer? This blog seeks to explore the stories of those Lithuanians and their near neighbours (Jews, Poles and others) who originated in what is now the republic of Lithuania and who arrived in Australia before 1947 (the year when World War II displaced persons from the occupied Baltic States began to arrive in larger numbers). The earlier arrivals were most often subjects of czarist Russia (1795-1917) or citizens of independent Lithuania (1918-1940). Some migrated to Australia intentionally, others came accidentally; some travelled directly, others arrived here from Scotland, the USA or other countries. This research project is being carried out with the support of the Australian Lithuanian Community Archives.